The Airborne Adventure is a one-of-a-kind inflatable attraction that allows your guests and attendees to experience life in the clouds! The game has an inner capsule that can hold two children, who are then harnessed in a parachute. A flick of the switch sends the adventurous player high into the air, almost 20 feet above the ground, for a bird's eye view of the entire event or party! Once the blower is turned off, the participant is gently lowered back to Earth for a safe and soft landing. 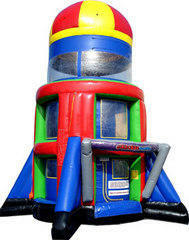 This amazing inflatable is like no moonwalk, slide or bouncy castle that you have ever rented before, Guarenteed! Its rocket ship-like shape and bright red, blue, yellow and green theme will attract guests from far and wide looking for an adventurous ride! 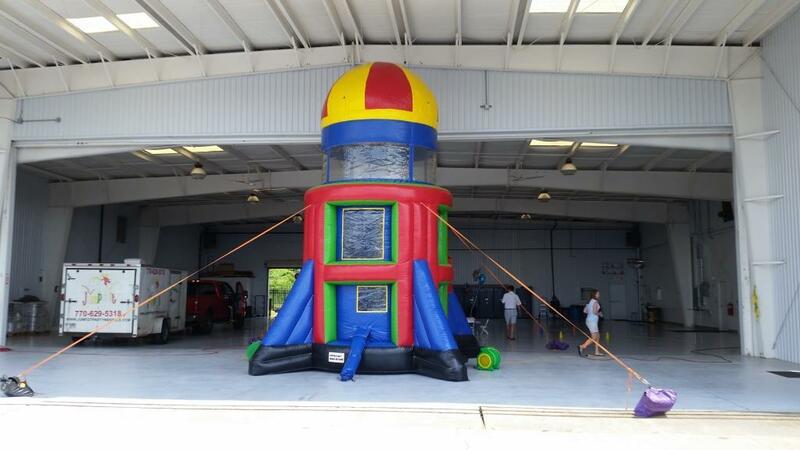 Jump 2 It Party Rentals is located outside of Atlanta, in Newnan, Ga and services Atlanta, Peachtree City, Newnan, Fayetteville, Carrolton, Tyrone, Brooks, Senoia, Riverdale, Jonesboro, Douglasville, Palmetto, Sharpsburg, Union City, Griffin and the rest of the Atlanta metro area for inflatable ride rentals.